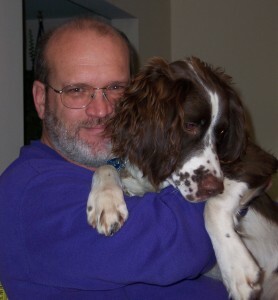 So Your Day Is Not Starting Off Too Well | Halcyon Management Group, Inc.
You can see from my picture that accompanies this post that I wear a beard (and also that I love my English Springer Spaniel very much!). But let me talk about my beard. Many men who wear a beard shave and then grow it back at various times in their lives. I have had my beard for thirty-eight years—straight. Since I grew it, I have never shaved it off. And although it has now turned completely white (I can’t even call it grey), it is a part of my appearance, which makes it a part of me. I have had to tolerate going bald, gaining my “middle-aged middle,” and having every part of my body turn against me (such are the joys of aging). But at least the hair on my face still grows, and that’s the way I want it. So as I am getting ready to go to work this morning, I look in the mirror, and realize that I need to trim my beard. I get out my beard-trimming machine, plug it in, check the depth setting for the guard (it determines how long or how close I cut my beard), turn it on, and take my first trim cut, which is always straight up the middle under my chin. With some surprise, I notice that there seems to be a bit too much hair coming off. I check the depth setting, and it is correct. And then to my horror, I realize that the actual depth guard had fallen off in the drawer—I had taken the cut up the middle of my neck under my chin with the bare blades! Dare I look? With great fear, I raised my chin to see in the mirror, and found that I had reverse-mohawked my beard. There in front of me was a single swath of pink skin that I haven’t seen in nearly four decades! So what do I do now? Do I have to shave my beard off and start over? Perish the thought! So I say to myself, not that I am a fashion maven, but there are some men who can pull off the “stubble-look” or the “five-o’clock-shadow look.” So I re-set the depth adjustment on my beard-trimmer to 3 (I normally have it set at 5), and trim the rest of my neck, but I can still see a “bunny-trail” straight up the middle. So I set the depth adjustment to 2, and go to work. While I could still faintly see where I made the mistake, it almost was blended in, and when I lowered my head and looked directly at myself in the mirror, I could not see it at all. So then I set about trimming the rest of my beard on the 2 setting. All I can say is that the “stubble-look” appears much more rugged and manly with a dark beard than with a white one! I look like I was attacked by a dust bunny! All of us get little surprises in our lives. You wake up to find out that your precious puppy has been sick all night—all over the house. You come home from work to find out that your lovely kitty has decided to sharpen her claws on your textured wallpaper. You come back in from the laundry room to find that your three-year-old has discovered how to get the top off of the Wesson Oil. You come back to your car in the parking lot to find that the tree that you parked under for shade was also a roosting tree for a flock of grackles. I have often said that the universe is a random place, but it seems like I get more randomness than I deserve! The truth about all of these little surprises (and some of the big ones too) is that once they have happened, there is absolutely nothing that we can do to change them. As a matter of fact, even if we live a well-planned and cautious life, there is nothing that we can do to prevent these little surprises. So what do we do? There is a great temptation to become angry when the universe’s randomness intrudes on our lives. I could feel a tickle of anger in my head when I realized that I had destroyed my beard. I could have slammed the medicine cabinet door in rage, but if I had, the only thing that would have been different would have been that I would also have had to clean up and replace the broken mirror. There is also a temptation to berate ourselves over these little things. We say things like, “Just how stupid can I be?” We really have to be careful asking ourselves a question like that, because the universe will find a way to answer it for us. Berating and blaming ourselves over these surprises does nothing but get us into a foul mood. So what do we do? We trim our beards in the best way possible. We clean up the dog doodie. We replace the wallpaper. We clean up the cooking oil. We wash our car. We just do whatever it is that we need to do to take care of the surprise. No drama, no anger, no rage, no self-condemnation—just take care of the problem. Probably a little later today I will be able to laugh about my beard. I would much prefer laughing at myself and the reminders of the absurdity in my life, than to allow little things to ruin a perfectly good day. So, when our day doesn’t start off too well, we can remind ourselves that it can only get better, and then set about making that so.